Home › Sociology › gender & feminism › Submit for the Down Under Feminists Carnival! 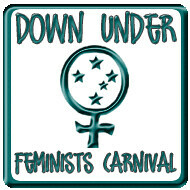 Submit for the Down Under Feminists Carnival! The Fifth Edition of the Down Under Carnival of the Feminists is scheduled for the first week of October at Hell On Hairy Legs. HellOn is a high school radical feminist who blogs about her life, patriarchy and miscellanea. Support our growing femibloggers’ networks by submitting your favourite September posts – yours others’ – to her before the end of the month. Please also take a moment to spread the word amongst your networks. Please use the blogcarnival submission form here. If the visual captcha there is not accessible to you, you can use the Hoyden contact form or email. The submission guidelines are here at the DUFC homepage, where you can also browse previous editions. We need new carnival hosts from February 2009 onwards, and volunteer offers are welcomed.